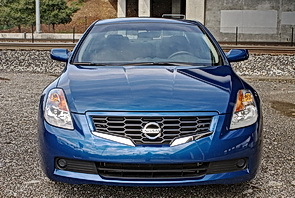 The 2009 Nissan Altima Coupe 2.5S, delivers to a youthful audience seeking to express themselves through a sporty-looking car, without the high-dollar sporty-car price. With the car’s sleek design, shorter wheel-base, and smaller size — all of the above contribute to its more aggressive performance than the Altima Sedan. It’s loaded with cool features including power sliding moonroof, 6-speaker audio system, AM/FM/CD, 16 inch aluminum alloy rims, Xtronic CVT™, Nissan Intelligent Key™, and a 175 hp, 2.5L engine to name a few. The Altima is a fresh design in the coupe market with its sleek lines and more robust body design — this car is eye-catching. It has a more compressed build when compared to its sedan counterpart; its shorter wheel-base made it handle better on the curvy roads. But it was equally comfortable driving on surface streets and freeways. With $4/gallon gas prices still fresh in our minds, optimum fuel efficiency is always a serious consideration among new car buyers and the Altima Coupe delivers good fuel efficiency with both engine options. Those who like to “power up” can choose the 270 hp 3.5L V6 and still achieve up to 18 mpg in the city and 27 on the highway according to EPA estimates. More conservative drivers who are comfortable with the 175 hp 2.5L 4-cylinder engine can get a miserly 23 mpg in the city and a whopping 32 mpg on the highway. Both the 3.5-liter V6 and 2.5-liter 4-cylinder models are available with Nissan’s advanced Xtronic CVT (Continuously Variable Transmission) or 6-speed manual transmissions. Although, if you want stability control, you have to order the V6 option. The Nissan Altima is a very sturdy car which is apparent from the solid “thunk” every time the doors are closed, to the smooth purr of the 2.5 liter engine. The exterior design of the Coupe has some lines reminiscent of the 350Z and its overall body design make this car stand out amongst the sea of Camrys and Accords. 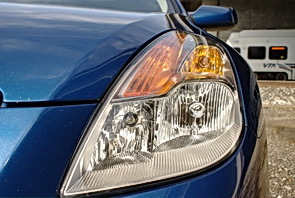 The headlamp, parking light, and front turn signal are all combined into one neat package which provides effective visibility during both day-time and night-time driving. Impressive are the Altima Coupe’s excellent safety reviews: 4-stars for Frontal Crash, 5-stars for Side Crash, and 5-stars for Rollovers. This car means business when it comes to passenger and driver safety. Driver, passenger, front side, and head side-curtain airbags are standard. If necessary, this car can take some serious hits and protect its occupants. Upon sitting in the Coupe, the interior is well designed with everything within arms reach – stereo system, venting system, internal lights, headlights, wipers, etc. All were clearly laid out and right where you’d expect them to be located. The cloth seat upholstery is simple, yet comfortable. The driver’s seat is capable of 8-way seat adjustment for optimal driving position. There is ample head room even with the power sliding moonroof. Which means that pretty much anyone can be comfortable while driving this car. From the little granny’s to the massive jocks, the Altima’s spacious interior was never too obtrusive. While the internal cabin lighting was rather bright during the night-time drives, it meant that if anything was dropped into the obscure reaches of the vehicle, it would be easy to locate. Like the front cabin space, the rear of the car was also very spacious for passengers or child car seats. Again, Nissan design engineers did their homework and made sure that weary travelers would be comfortable in the back with ample amounts of leg and seat room. Another nice feature was the LATCH system which anchors and tethers child car seats to the rear-seats; they were very robust and strong. The only down-side was the passenger 60/40 seating was difficult to put down – one seat was on a button latch (easy to find), while the other had a release strap found in the trunk (hard to find). Not super intuitive, but once found, it was easy to operate. Overall, the Coupe is a pleasantly, comfortable vehicle to drive for both city driving and long adventures out on the open road. This Coupe was hooked up with the 6-speaker base stereo system. It has good sound clarity even when blasting the bass – a definite plus. As to be expected, also offered for 2009 is a long list of user-friendly technology features – including standard Nissan Intelligent Key, available Bluetooth® Hands-free Phone System, an advanced touch-screen navigation system with XM NavTraffic® with real-time traffic information (XM® subscription required, sold separately) and RearView Monitor. Probably the most disappointing part about test driving the Altima was its lack of power. Something seriously amiss in such a flashy coupe. Nissan fell short on the “eye-opening exhilarating power” it promised in its press release. For a car with a 2.5-liter DOHC 16-valve QR25 inline 4-cylinder, producing 175 horsepower and 180 lb-ft of torque, the Altima lacked the serious pick-up required when asked to accelerate. For a sporty car, the freeway on-ramp accelerations were something to be desired. Once up to speed though, the Coupe drove very well. It was smooth and quiet. At times, I found myself passing over 80 mph without even flinching. The Altima seemed most comfortable when driving along at a steady speed with gentle accelerations. It never felt like it was packing much power and the overall driving experience is what you’d expect from a normally aspirated 4-cylinder engine – practical.